Highly efficient motor-powered tail motor with elaborate structure. The New 22E tail motor outperforms previous models. 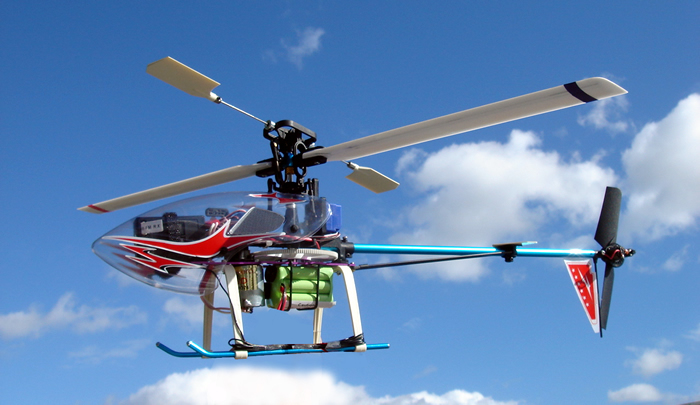 The helicopter can fly in flight course, reversing and 3D aerobatics. Simplified structure, adopting CCPM 3D model alterable pitch system. The transmitter is equipped with 3D model conversion and mode-lock switches. Its PIT and PLT buttons are convenient to adjust to the best flying state. Powerful 370 carbon brush motor as main power. Newly Designed Rotor Head gives better control. Lightweight body built with strong materials. Durable Landing skids and Tail Boom made of Aluminum material. More Stable hover and 3D flight. 6 Channel remote control set includes complete Forward/Backward, Left/Right, Up/Down, Control (RUDDER, AILERON, ELEVATOR AND THROTTLE, PITCH). The transmitter comes with Pitch Adjustment and CH5 control. It has 3D conversion, PIT and PLT adjusting knob. High Quality 4-in-1 receiver board. 3 High Quality and High Speed Servos and outer gyro. READY TO FLY. Only requires AA Batteries for transmitter. Approx 10 minutes of flight time. Fly both indoors and outdoors. This helicopter is an ideal investment for those people looking to move onto the larger scale gas powered helicopters, and can give you excellent training in preparation to fly the big birds! Tail motor: N30 brush motor. Radio System: 6 channel transmitter, 4 in 1 controller (including receiver, mix controller, ESC, gyro), 3pcs 7.6g-2 gyros. 3 x 7.6 g servo and outer gyro.